Two of the most prevalent orders that protect trains and crews from unusual conditions are the Form Y and the slow order. A Form Y is what SP railroaders call a 'gang order', an order designed to regulate train movement through an area where a track gang is at work. A slow order, self-evidently enough, requires trains to go slower than normal timetable speed over a given section of track. The reason can be anything from a track defect to high winds or maybe even an efficiency test. Slow orders are but one version of the everything-but-the-kitchen-sink Form X train order. The kitchen sink is the gang order, because all else by way of warnings, advisories and general exhortations to use caution is found within the ill-defined limits of the Form X. See below. A couple of other forms deserve mention here. The Form D-S is used when one track of a double track main line is temporarily taken out of service, and the remaining track is operated as single track (a.ka.a : 'single tracking'). 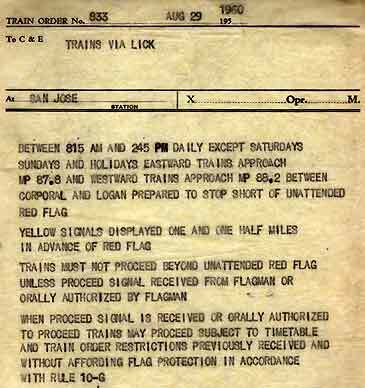 This is an involved operation that requires flagmen at either end of the single track portion who authorize trains through the limits. The Form D-S corresponds favorably to today's track warrant Form D. The Form D is more versatile, though, because it is also used to authorize single movements against the current of traffic when both tracks are in service. This sort of thing is only done in unforseen situations and is handled over the radio. 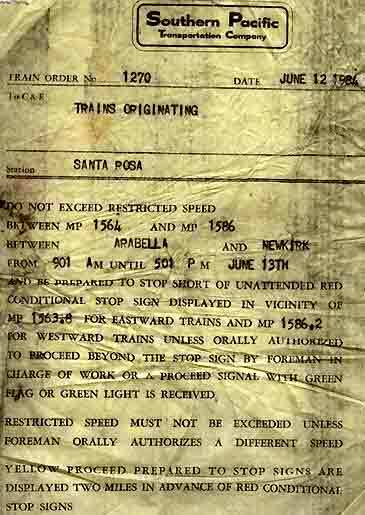 SP's train order system had no provision for against-the-current moves. The only way that they could be accomplished was by sending a train crew member out as a flagman to protect the move. The other is the Form Z, used when signals are temporarily taken out of service (note that the signal must be physically covered, or their heads turned away from the track to avoid confusion about their status. Like single tracking with Form D-S, this gets very involved, but basically, the railroad is operated like non-signalled territory (railroad vernacular: 'dark territory'). In dark territory, passenger trains by law can operate at a 59 mph maximum, and freight trains up to 49 mph. Rule 99 flag protection must be provided by the crew unless otherwise instructed. Reverse and Back-Up Moves Here's something that we love to spring on know-it-all young railroaders: What is the difference between a reverse move and a back-up move? Answer: A reverse move is a movement in other than the normal authorized direction. If you move past the last preceding signal in double track territory, you are going against the normal current of traffic and are making a reverse move. If the rear of your train is inside an interlocking or CTC control point and you reverse direction, you are making a reverse move, because you have no signal authorizing your movement. A back up move simply means to move in the direction opposite from the front of the engine or train. This is not quite as simple as its seems, since many trainmen get confused about this when their engine is facing rearwards on a train. Do you go by the forward direction of the train, or engine? The explanations is that when you are talking about the whole train, a back-up move is in relation to the train, but if you are signalling the engineer using a lantern, you consider the alignment of the engine, the train be damned. Often slow orders contain pertinent info about the restriction. Others might say "account broken [switch] frog", "account broken rail", or "account Norwegian Heritage Days' kippered herring eating contest being held within six feet of the tracks". Here's five more examples of the catchbasin Form X. Top left: track that has had the ballast removed around the ties is 'skeletonized'. Left: 'bad footing' advisories were held to a minimum at mid-century, but have since blossomed in direct relation to California's attorney population growth (currently, every third person). Below left: This is the kind of instruction that engineers absolutely hate. What in the hell does 'carefully' mean? Answer: If you hit something, you're fired. Today's dispatchers love to use 'with caution', a term that has not appeared in the rule book for almost 30 years. The answer is the same. We surely would have appreciated a Form X, like the one below, back in the late 1970's, when Wx4 forces on the BSSJT (Bayshore - San Jose Turn) were instructed to set out a boxcar at the Menlo Park team track, only to find that its switch had been ripped out the day before. The car went to California Avenue. Form Y Conditional Stop Sign Orders are written according to the boiler plate contained in the book of rules. Originally, the operators had to type the entire order 'longhand' (remember, no mistakes! ; also, carbons would only generate a limited number of copies). See below. At some point, somebody apparently realized that this wasn't an efficient use of time, and proscribed the use of the fill-in-the-blanks form that you see at bottom left. This worked out better for operating crews as well, because the pertinent data now sort of jumped out of the order. The orgin of Southern Pacific's Form Y is unclear to us. We're guessing that the first ones were cut not long before the 1960 order, below. The Wx4 collection has no similar orders that predate the Form Y, and the rule book contained no appropriate form. We're guessing that the track gangs were left to protect themselves with guns (torpedos) and flags.